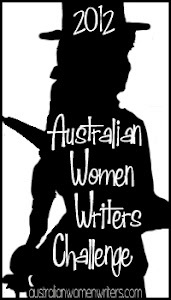 This is a review for the Australian Women Writer’s Challenge 2012 and has been delayed because I’d been trying to find time to do it justice. Justice or not, time is running out, and so here is my (belated) review. This is Book #3 based on my original pledge back in January! I’m certainly ready to complete the challenge, and this post will constitute the formal finishing, though I am hoping for an opportunity to review a few more books in depth. I have done some reasonable reviews on Goodreads througout the year. I am planning on continuing the challenge into 2013, so if you’re also on Goodreads, feel free to friend me. Join Salisbury Forth on twenty adrenaline-fuelled days as a courier of contraband in the alleyways of inner Melbourne, a city of rolling power outages, fuel rationing and curfews. Life’s stressful, post-pandemic: a vaccine dispensed Australia-wide has caused mass infertility and people are scrambling for cures. This would be fine for the hormone business, except the new government has banned all remedies except prayer. Now the pious gather under the streetlights at dusk and the Neighbourhood Values Brigades prowl for ‘transgressors’. Meanwhile, the out-of-town animal farms have started up a barbarous form of hormone production and the Animal Protection Vigilantes are planning their next raid. 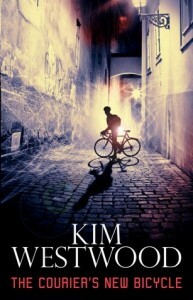 ‘The Courier’s New Bicycle’ is one of my stand out best reads of 2012, and that’s why I’ve delayed this review so long as I was trying to find useful words to review it with instead of flailing wildly with joy and splattering words all over the place… not sure I’ve moved on sufficiently, but we’ll see. I’m head over teakettle in love with Melbourne, and Westwood has evoked the essence of Melbourne beautifully in this book, including taking it into a darker place where conservatism rules. The politics of this book resonate with me strongly and I appreciate Sal as protagonist being someone with a non-binary gender presentation, and also a non heteronormative sexuality. And, it isn’t as though these are immediately central to the plot, except they are in an oblique way because they are central to Sal, who is fielding this new future society that distrusts and despises zer. In a future weighed down by fertility crises, it is no surprise that the politics of gender, sexuality are central themes. The characters in the story have a realness to them that I really enjoyed, they’re ordinary people living in a society that they struggle with, who acts against them. And yet they still seek to act for the greater good, trying to make a difference whether to battery farmed animals, or to each other. The importance of chosen family is emphasised in this book, and this pleases me as someone who appreciates both blood and chosen family in vastly different ways. Sal’s integrity is one of the things I like best about the character, forthright and honest, there is struggling with keeping secrets, even if for good reason. Reluctant detective or not, Sal is believable throughout the story and the gentle threads of romance and friendship that underpin the story are brilliantly woven. Shortlisted for the Tiptree Award*, it’s easy to see why, the exploration of gender and sexuality politics is deft and insightful. There are easily recognisable echoes of existing fears and politics in these areas for those of us who are queer in our gender, sexuality, or lifestyle. It’s not to hard to imagine this kind of future, but knowing others are able to imagine it makes me feel a little less alone in this fearful imagining. Also, this book has a story so well told that I have to hope it will reach people and open eyes previously closed to the lived reality of people who are othered. Some have described the books as dystopic, however I’m not among them as I find the future described in the book all to plausible. Highly recommended, I just can’t say enough good things about this book. *Thanks to Tansy correcting me that this book didn’t win the Tiptree, but it was shortlisted, now corrected!